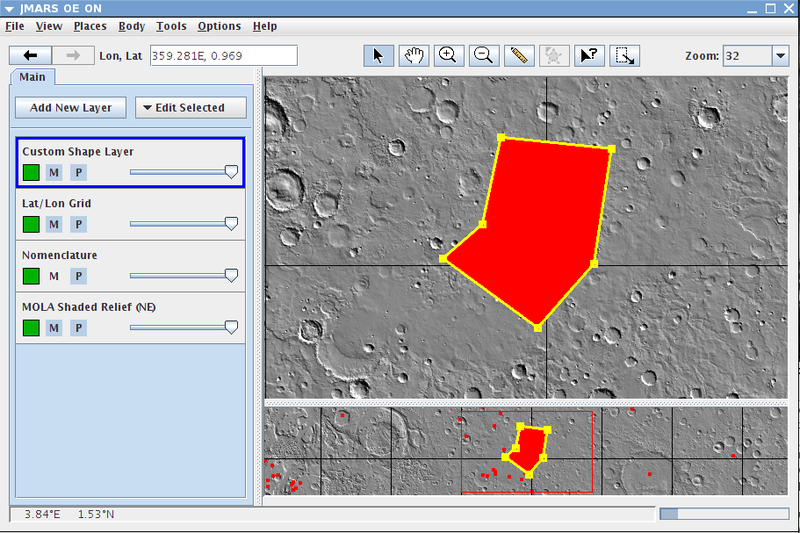 This functionality was released in version 3.6.3 of JMARS. The purpose of this tutorial is to learn polygon functionality. This tutorial will introduce Intersecting, Merging, Subtracting polygons from one another using the shape layer. In the Layer Manager, click "Add New Layer" -> "Custom Shape Layer"
Right click the main screen and select "Add Polygons"
Draw two polygons on the main screen and make sure they are overlapping one another. 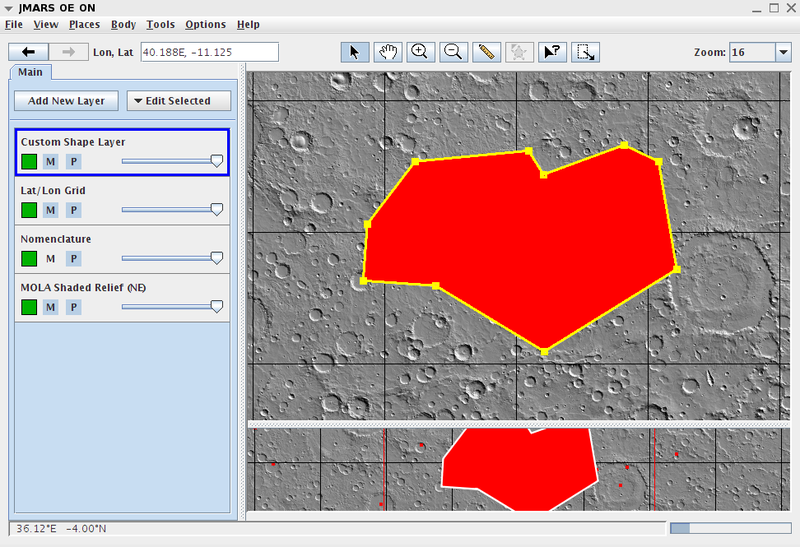 NOTE: Intersect and Merge both allow the user to use 2 or more polygons. 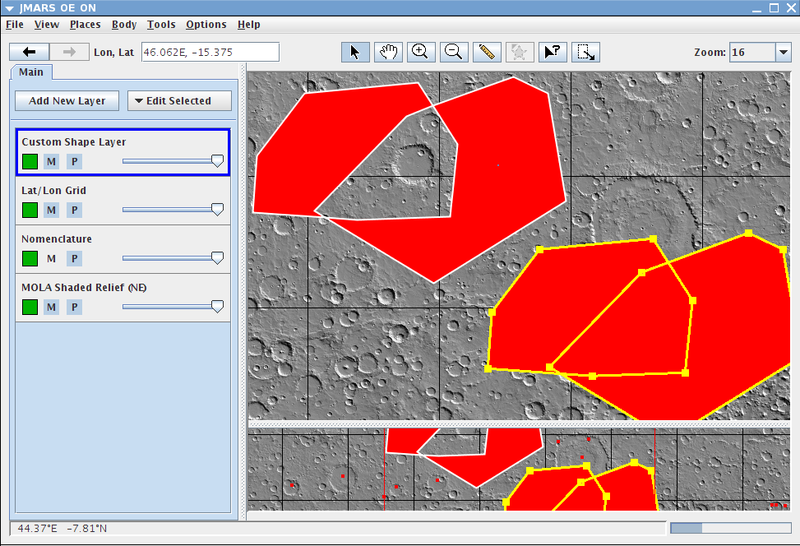 The intersect polygons tool will allow the user to find the common area between two or more overlapping polygons. Right click the main screen and click "Select Features"
Select both polygons by either clicking on one, then ctrl + click on the other OR draw a quick box over both polygons. When the polygons are selected, they will both be outlined in yellow. Right click the main screen again --> "Polygon Functions" --> "Intersect polygons"
The original polygons should still be selected. Move the original polygons or erase them if they are no longer needed. When the original polygons are moved, you can see another polygon. This polygon is the product of the Intersect Polygon Tool. The remaining polygon should match the overlapping area of the original polygons. This tool has the opposite functionality of the intersect tool. Subtracting polygons takes the overlapping area and deletes the common area. This functionality only works with two polygons. Make sure you have two polygons drawn on the main view that are overlapping. Right click the main screen again --> "Polygon Fuctions" --> "Subtract polygons"
The original polygons should still be selected. Move the original polygons or erase them if they are no longer needed. When the original polygons are moved, you can see another polygon. This polygon is the product of the Subtract Polygon Tool. The remaining polygon should have the common area removed. 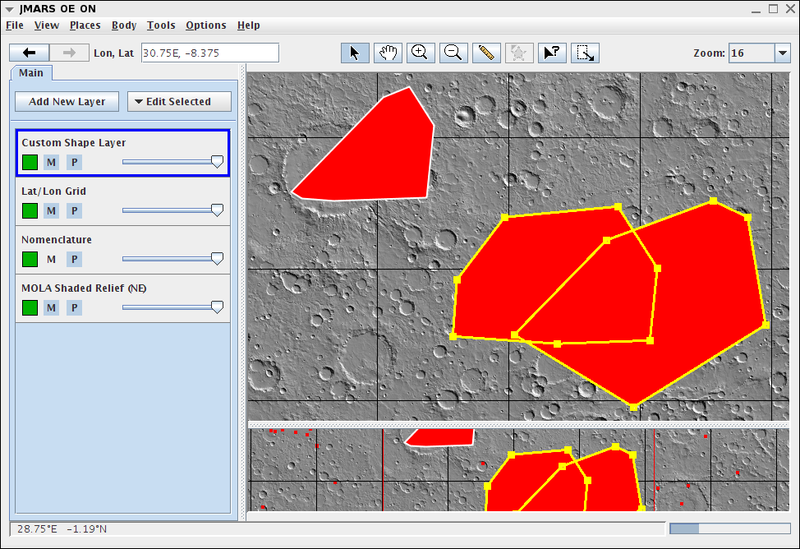 The Merge Polygon Tool allows the user to take two or more overlapping polygons and create one polygon from them. Start with two overlapping polygons as we did in step 2. 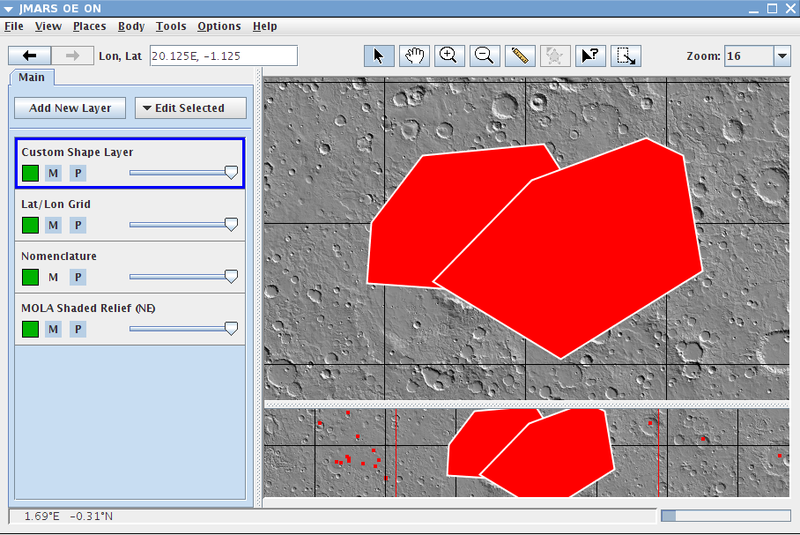 Select the polygons by either clicking on one, then ctrl + click on the other OR draw a quick box over both polygons. When the polygons are selected, they will both be outlined in yellow. Right click the main screen again --> "Polygon Fuctions" --> "Merge Polygons Together"
Click the polygon on the screen. Your new polygon is on top while your original polygons is underneath the new merged shape. 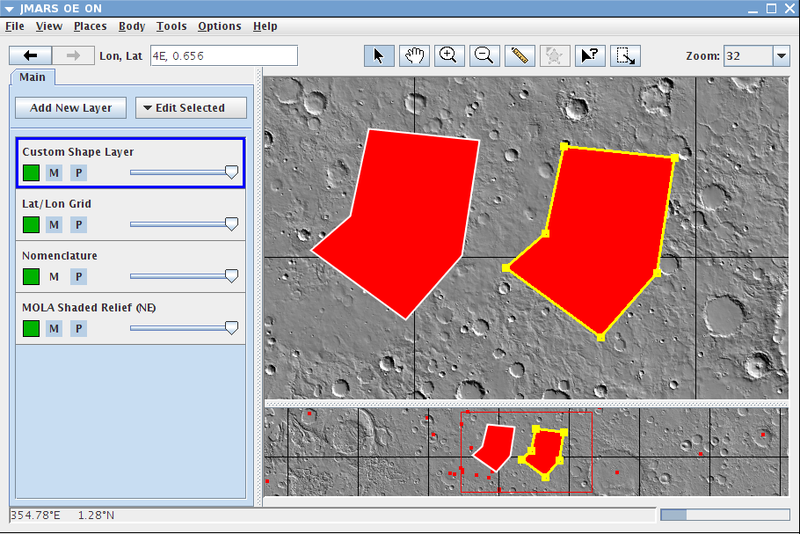 The Duplicate Polygon Tool is a copy and paste feature. 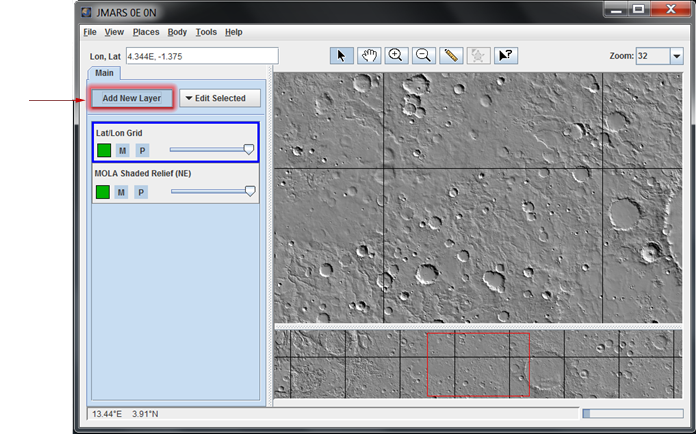 It allows the user to select one or more polygons and make a copy of the polygons. Draw one or more polygons on the main screen. Right click the screen and select "Select Features"